Summerfield - "Your Home Team Advantage!" Summerfield NC located in Northwest Guilford County and the Piedmont Region of NC is an area of rolling hills, open fields, wooded countryside, residential neighborhoods, and limited commercial development. The town is easily accessible to Greensboro and the Piedmont Triad International Airport, Summerfield is an attractive community with excellent schools, parks, developing trails system, and low taxes. “Respectful of the past and focused on the future”, Summerfield NC is a great place to live grow and play. Summerfield NC was incorporated in 1996. Originally named Bruce’s Crossroads the town was at an intersection of two stagecoach routes. It was to play a pivotal part in the Revolutionary War and the Battle at Guilford Courthouse. While Summerfield NC still adheres to its rural roots; today among the horse farms and open countryside there is vibrant residential community. In the last few years Summerfield NC has experienced significant growth. A new elementary school middle school and high school have been built to better serve the area. Northern HS opened its doors in 2008 and has won 4 state football championships as well as garnered many academic distinctions in a short time. Summerfield Community Park located in the center of town provides numerous recreational opportunities for the community. Including walking trails playgrounds picnic shelters exercise stations fishing and an outdoor amphitheater for community events. Summerfield Athletic Park officially opened in 2011. There are three ball fields, a large multi purpose field , a playground, and a field house with concessions restrooms and press box. Summerfield also is active in developing a portion of the Mountain to Sea Trails through the town. There are additional recreational opportunities at Haw River State Park which borders Summerfield and the Lake Brandt Greenway . If you are a Golfer there are opportunities galore. Greensboro National, Bryant Park (2 courses), and Crooked Tree are excellent public courses. There are two par 3 courses close by as well. Of course for the Equestrians there are numerous places to ride in Summerfield. 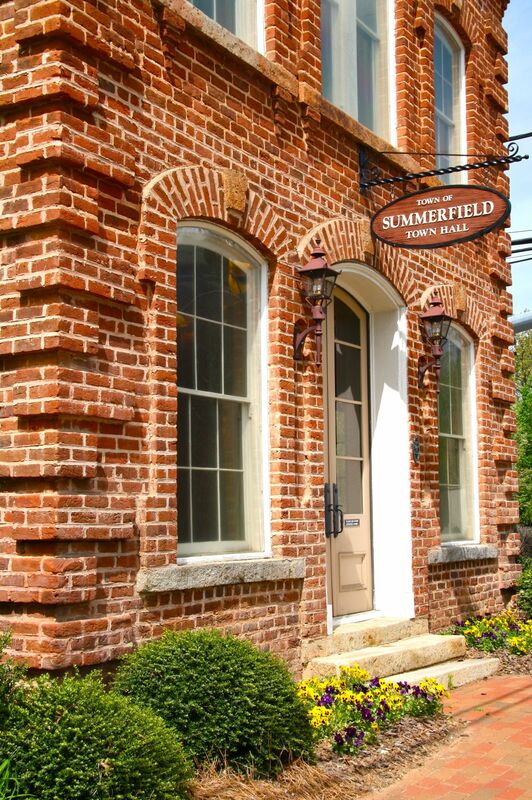 Summerfield NC celebrates its community spirit yearly with its annual Founders Day. A day of festivities to celebrate the past and look forward to the future. With its good schools low taxes (the city runs a budget surplus), convenient location, rural setting, and beautiful homes; you will want to make Summerfield NC your home. Call us at 336 253 4693 or email us. Your Home Team Advantage will help you buy or sell your home. 42.95 acre estate. Northern Schools. Tastefully finished steel constructed home built to withstand hurricanes & earthquakes. 10’ & vaulted ceilings w/natural light streaming throughout. Brazilian cherry hardwoods on ML. Great rm, den, office. Kitchen open to fireside keeping rm. Master suite w/spacious BR, sitting area, sunrm & remodeled BA. Nanny suite. Fantastic basement rec room w/acid stain floor. Deck spans the back of the home & overlooks the natural beauty of the land that surrounds this home. Best of Both Worlds! Secluded custom estate between two neighborhoods! Intelligently designed plan encourages natural flow, flexible living areas and expansion possibilities. Outdoor living and entertaining areas overlook 6 totally private acres. Warm & comfortable making the most of function & beauty. Secluded master with sumptuous bath and lavish guest suite on main level. Oversized island, spacious pantry, Alder wood custom cabinets and designer fixtures. Blending Rustic & Modern this home delivers! Its hard to pick your favorite feature! Super Custom European style home with floor plan designed for gracious entertaining. Luxurious, private Master Suite w/spa bath, Fireplace & large closet. Flexible Bedroom locations for 2 on Main or 1 on lower level with Club room, full bath & tons of storage. Beautifully manicured property, English Garden, Infinity pool with magnificent stacked stone surround & waterfall. Incredible 29'x18' Paradise covered Deck w/bead board ceiling, speakers, & ceiling fans. Rural 10 AC wooded retreat w/ private pond in Northern School District. Flat shoreline & launch pad for canoes & fishing. Open floorplan w/ 3 bdr on main & inlaw/guest suite on lower w/ kit & sep entrance. Main KIT w/ granite & concrete tops, Ge Profile appl, 5 burner Dacor gas stove & nat stone bcksplsh. 10' ceilings ml, hdwd floors, covered porch w/ hot tub, 40' pondless water feature, fire pit w/ stone terrace. Private cul de sac w/in walking distance to High Caliber Stables. Come experience serenity! OLD WORLD CHARM in Prestigious Tuscany at Henson Meadows! New Construction Soon to be Built. A Perfect time to personalize & make your own selections. Double Master. Chefs Kitchen overlooks Vauted Great Room w/Wood Beams. Main level Grand Master Suite/Spa Bath. Main level Guest Suite. Formal Dining & Executive Office. Upstairs boasts 2nd Master suite, large Bedrooms, Bonus Rm & Theater Rm. Wonderful outdoor living area. Beautiful Wooded Cul-De-Sac Lot. Owner/Broker. Please call agent for information. A must see! Located in a private neighborhood, this home sits on 1.88 acres. 3 car attached garage. Elegant Chandeliers. Located in a rural area yet close to town, offers the amenities for family living. Master and In-law suite are located on the main level. Kitchen has built-in appl. & granite counter tops. This home offers large rooms throughout, bonus room, theater room and rec room, dual staircases, built-ins, crown molding, hardwood floors & 3 fireplaces. Community clubhouse w/ pool & tennis courts.